The Potomac Basin Reporter newsletter is a resource on water quality issues for the residents of the Basin. It was published in paper format from 1945 until the final paper newsletter went out in 2012. 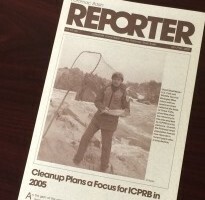 In 2017, ICPRB re-introduced the newsletter in an electronic format. Please sign up for the Potomac Basin Reporter and the sister-publication, Potomac News Reservoir, to receive updates and news on events in and around the Potomac River basin. An archive with PDFs of the paper newsletters from 2001-2012 is available below. Click on a year to explore article titles within the Reporter issues or download the newsletter. You may also use the search bar in the upper right of our website to browse topics that might appear in the Reporter. Copies of the Reporter dating back to 1945 are available in our office library. Please contact us to receive an electronic copy of a newsletter published prior to 2001.